Citric Acid, Malic Acid, Natural and Artificial Flavors, Acesulfame Potassium, Sucralose, Gum Blend (Cellulose Gum, Xanthan Gum, Carrageenan), FD&C Blue #1. WARNINGS: Not for use by individuals under the age of 18. Do not use if pregnant or nursing. Consult a health care professional prior to use if you have, or have a family history of, heart disease, diabetes, high blood pressure, depression or other psychiatric condition, glaucoma, or seizure disorder, or if you are using a monoamine oxidase inhibitor (MAOI), lithium, any prescription drug, or any over-the-counter drug. Avoid other sources of caffeine during use. This product is not intended as a substitute for sleep. Do not use if packaging has been tampered with. Store in a cool, dry place. KEEP OUT OF REACH OF CHILDREN AND PETS. ALLERGEN WARNING: Produced in a facility that also handles Milk, Soy, Wheat, Egg and Tree Nuts (Coconuts). Natural and Artificial Flavors, Citric Acid, Malic Acid, Acesulfame Potassium, Sucralose, Gum Blend (Cellulose Gum, Xanthan Gum, Carrageenan), Fd&C Red #40. All The Good Stuff, None Of The B.S. 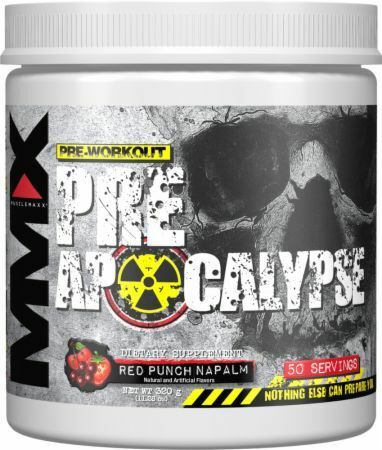 PRE APOCALYPSE comes in two amazingly delicious flavors, Blue Wraithberry and Red Punch Napalm*. Red Punch Napalm This is a Buy 1 Get 1 FREE offer! Blue Wraithberry This is a Buy 1 Get 1 FREE offer!